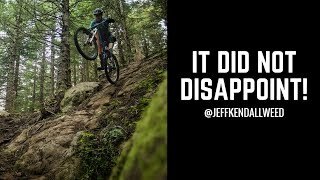 What do you get when you throw Jeff Kendall-Weed aboard his IBIS Ripmo at some of Washington States most gnarliest trail? You get smooth style and a flow on a big wheeled bike that you wouldn’t think is possible in such terrain. Immerse yourself in Jeff’s riding style as this time he heads to Washington’s Invictus trail along with some laps on it’s sister trail, No Service. You’ll be left thinking “how can someone manual down that”?